Hi all, Pretty Handsome Guy here filling in for Brittany. Last night Brittany and I were wrapping presents and I thought I’d share with you some common gift wrap problems and how to deal with them. Think of this as the polar opposite of her Creative Gift Wrapping series of posts. Do you ever end up with a present that hangs out of the wrapping paper? and just for good measure add some more tape. Hey, tape is cheap, no need to be stingy with it! All done, and the goal of hiding the present has been achieved! How many times have you cut your wrapping paper only to realize that it is too short to go around the package? When it comes to wrapping presents I adhere to the adage “measure never, just cut it”. I mean seriously people we aren’t building a house here, what you are wrapping is meant to be destroyed anyways. Tape it on (no need to match up the pattern, no one will see the bottom when it is under the tree.). Bonus points if you can manage to use 2-3 different types of wrapping paper – just tell everyone it is a “holiday medley”. 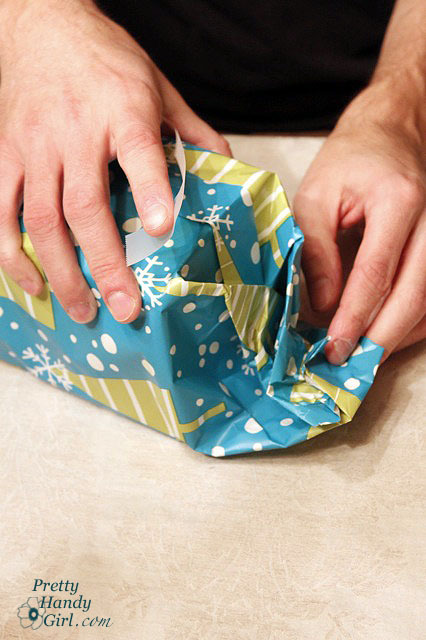 Super easy solution and the best part is that you don’t have to go back and cut a whole new piece of wrapping paper. The environment will thank you for this one. Now we are down to one of the most common wrapping problems. What to do when you have too much wrapping paper on the ends of your package. And yes I realize most of these “problems” are a function of not measuring in the first place but whatever. Normally I would simply roll the sides in until they meet the package, but in an effort to neaten things up a bit, you can simply gather the end in your hands and snip off the excess. Now simply fold in the end towards the box. …until you reach the box, then smash the end down with your hand to flatten it. And tape your end down. Done. Problem solved, any questions? I found the little key tags that Brittany bought for tagging her presents. Creative idea and all but sheesh a lot more work than a stick-on “To/From” tag. But I devised a new way to attach them to the gift without ribbon. Simply grasp a corner of your package and use a hole punch to make a hole in the gift wrap. Thread the “tapepick” into the hole you made in your gift wrap. Then grab another piece of tape and fold it over the ends of your tapepick to secure them. That’s it. Thanks for reading my post today. Hopefully Brittany will invite me back to show you how I make a bed in less than 10 seconds! That is too funny. I have seen my Handsome Man and my kids wrap presents like that. This is exactly how I wrap gifts. I STRUGGLE – and I have no clue why. I can bake, draw, etc etc etc – Heck, I can even keep it in the lines when I’m coloring (go me!) but when it comes to a box, paper, tape, ribbon and scissors – I’m screwed. My 3 year old niece wraps better than I do. LOL. We used to say that our oldest (at age 5) was in charge of wrapping and not Pretty Handsome Guy. He really was better at it than his Dad. So cute and lighthearted – perfect for this time of year! Love it! Your post brought back memories of receiving gifts wrapped like yours….but mine also contained lots of duct tape. One year, I found a gift addressed to me and the ‘from’ said “Love, Santa”. LOL, I guess Santa needs some wrapping tutorials himself.